The "MSVCP100.dll is missing" or the "MSVCR100.dll is missing" issues commonly occurs, after updating your system to the latest Windows version (e.g. after migrating your system from Windows 8.1 to Windows 10) or after restoring your system to a previous restore point by using the Windows "System Restore" feature. In this tutorial you'll find instructions to resolve the "msvcr100.dll is missing" or the "msvcp100.dll is missing" errors in Windows 10, 8/8.1 or 7 OS. How to FIX: "Program Can't Start because MSVCP100.DLL or MSVCR100.DLL is Missing". Method 1. Uninstall and Reinstall Adobe Acrobat Reader DC. The first method to resolve the "MSVCP100.dll is Missing" issue, is to remove and then to reinstall the 'Acrobat Reader DC' program on your system. 1. Navigate to Windows Control Panel and open Programs and Features. 2. Select the Adobe Acrobat Reader DC and click Uninstall to remove it. 3. Follow the on-screen prompts to remove Acrobat Reader and then restart you computer. 4. 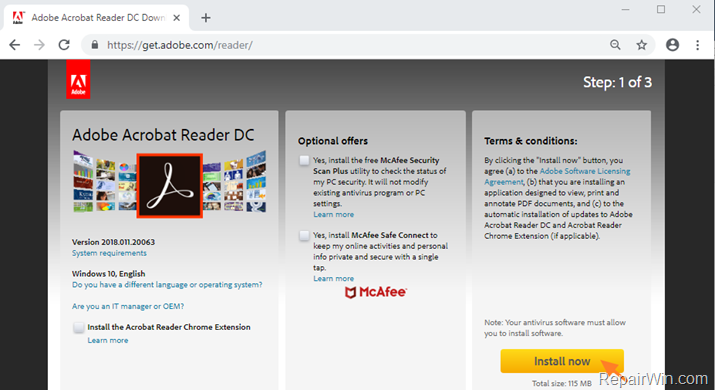 After restart, open your Web browser and navigate to Acrobat Reader DC Download page and click the Install now, to download and install the latest version of Acrobat Reader for your system. Method 2. Repair all versions of Microsoft Visual C++ Redistributable Package. 2. Find and repair one by one* all the installed versions of "Microsoft Visual C++ Redistributable Package(s)". * e.g. 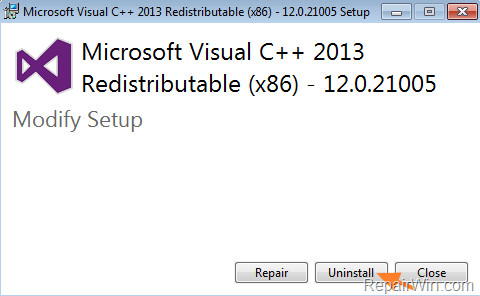 Select the "Microsoft Visual C++ 2013 Redistributable Package (x86)", click Change and then click on Repair button. When the repair process is completed, highlight the "Microsoft Visual C++ 2013 Redistributable Package (x64)" and perform the same steps (Change > Repair). ** Note: If you cannot find (any version of) the "Microsoft Visual C++ Redistributable Package" on the installed programs, then proceed to method-3 below to install it. 3. When the repair is completed, restart your computer. Method 3. 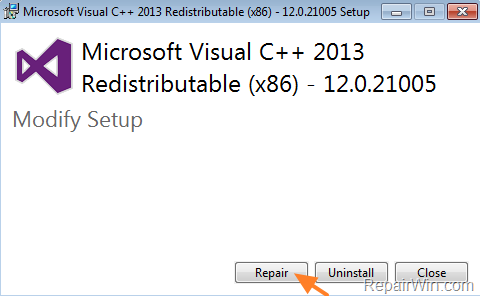 Uninstall and reinstall the latest Microsoft Visual C++ Redistributable Package. The next method to solve the "Program Can't Start because MSVCP100.dll is Missing" problem, is to remove all the installed versions of Microsoft Visual C++ Redistributable Package and then to download and install the latest version. 2. Find and remove (one by one) all the installed versions of "Microsoft Visual C++ Redistributable Package(s)". 3. After uninstall, restart your computer. Method 4. Copy missing files to the correct location. 1. Copy the files "msvcp100.dll" & "msvcr100.dll" from "C:\Windows.old\WINDOWS\SysWOW64" folder to "C:\Windows\SysWOW64" folder.